It was my little sister J's birthday a few days ago, and we had an afternoon tea for her today. I had some fun doing a bit of 'silly cooking'. 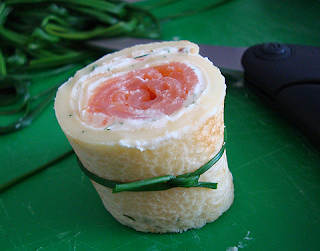 These are smoked salmon rolls - first you make crepes, then mix together cream cheese, lemon juice, mustard, and fresh dill. Spread each crepe with the creamy mix. 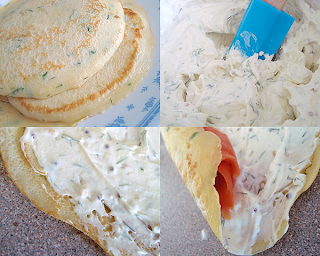 Roll up some smoked salmon, place it on the edge of each crepe, and roll up. Cut into 2 cm lengths. This is the mad part - dunk a bunch of chives into boiling water for 1 second, then use them to tie up each little roll. Trim the ends. This works much better and more easily than I was expecting! Isn't it cute?! The recipe made around 20 rolls. They were really delicious, too! There was also Hummingbird Cake (banana, pineapple, walnut) - a fat-free version (Symply Too Good To Be True, Book 3). (No, I didn't make the roses, I copped out and bought them in a pack at Woolies.) 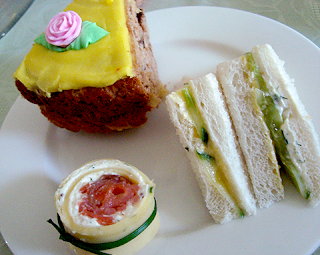 There were also Cucumber Sandwiches, and Vegie Sticks with Dip. With tea in fancy china tea cups. It was lovely. 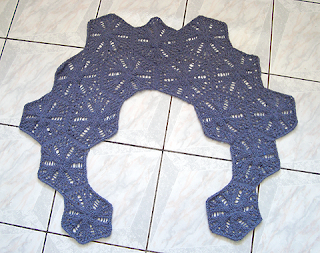 I gave her this Medallion Wrap (Rav link) - the first Norah Gaughan pattern I've made. I started this back in August 08, without a clear idea of who it was for, but in the past 2 weeks I realised it would be perfect for my sister, and put on a push on to finish it. It suits the colour of her eyes perfectly, and is the right sort of unusual style to appeal to her. She loves it :) She even wore it for about 5 minutes, which given the horrible summer heat wave we're in, says something! 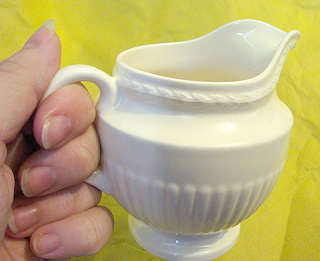 I also found this gorgeous little Wedgewood milk jug at the delightful Minnamoora Antiques and Collectibles in Phillip (on Taph's recommendation, thank you!). It's Queen's Ware from the 1940s. Apart from reminding J of the Grecian urns at the British Museum (where she used to be a curator), it also replaces the tiny antique milk jug I broke at her house a few months back while doing the washing up (see, proof that chores are dangerous things ...). It pours beautifully, and is really delicate. All in all a very lovely day. It's still such a treat to have J and her hubby and little boy over to visit, after 6 years of them being in London. The Book is nearly really truly totally done - I've got about 2 days of editing to go (double checking the hints for each puzzle), and then THAT'S IT. The text, illustrations, and puzzles go to layout next. I'll see it again once the Wiley graphics team has done the layout, and it's looking like a real book - probably in early March? That will be my last chance to check it before it goes to press! It'll be in the bookshops in the USA and Canada at the end of April. I have to plan the book in detail, including 2 stickers for each page, and write around 70 pages of crosswords, word searches, mazes, picture acrostics, and other puzzles. The illustrators will do all the colouring-in, dot-to-dots, and illustrate my puzzles as directed. How cool is that? This book will be for sale in Australia, the USA, Canada, and UK, also around end of April. And I'm having a month's holiday from mid March on ... if I can remember how to relax ... ! Oh your salmon rolly uppy things look fabulous and I love your whole afternoon tea. I think my very favourite meals are brunch/elevenses, afternoon tea and supper!! The wrap is so pretty, I'm looking it up!! I'm going to steal your salmon roll for my next knitting party. That is SO pretty! The medallion wrap is beautiful and oh, that wedgewood jug is divine! Hooray on a nearly finished book! You can SEE the end of the tunnel, and there's blue sky with birdies singing out there! Mmm, I think I need to come to your house for afternoon tea! Hummingbird cake, sounds so wrong but looks so right! Must try it! The medallion wrap looks very cool, and the milk jug is just perfect! Great gifting! Oh, I so wish I had a big sister like you who would make me a tea for my birthday. Your preparations look so delightful and delish! And hooray on your book! Those salmon rolls! Oh how divine. I love them. the chives bit is a bit mad, but oh why not go the whole way if you can? 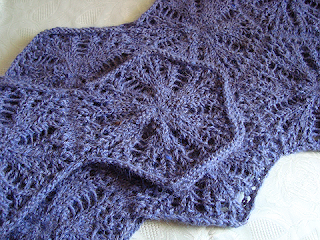 Medallion scarf looks wonderful. So glad you're still getting time to knit! I love the idea of afternoon tea. I have a daughter with a birthday in April who would love a tea. I'm going to invite her and her friends and make rolls (maybe without the salmon) and little cakes. It sounds lovely. And yay!!! for the almost finished book. THat was a long time coming. You totally deserve a month vacation. The afternoon tea is wonderful. I love the salmon rolls with the little chives ribbons. So adorable! I hope all your work was appreciated. Sounds like a lovely party! The scarf came out beautiful, but I am getting a big giggle trying to picture YOU relaxing! There is just no way you remember how! LOVE the medallion wrap. LOVE the smoked salmon wraps with the chive ties. LOVE the little Grecian Urn milk jug. I'm a puzzle writer, author, indexer, and graphic designer. We Love You: Year, Year, Year! Group afghan #2 - Done and Dusted!